2nd issue: How do I lazy load? How to lazy load: IntersectionObserver FTW Don't bind to the scroll event. Subscribe to an event triggered when the image enters the rendered area Supported in Chrome, Opera. In development in Firefox and Edge. 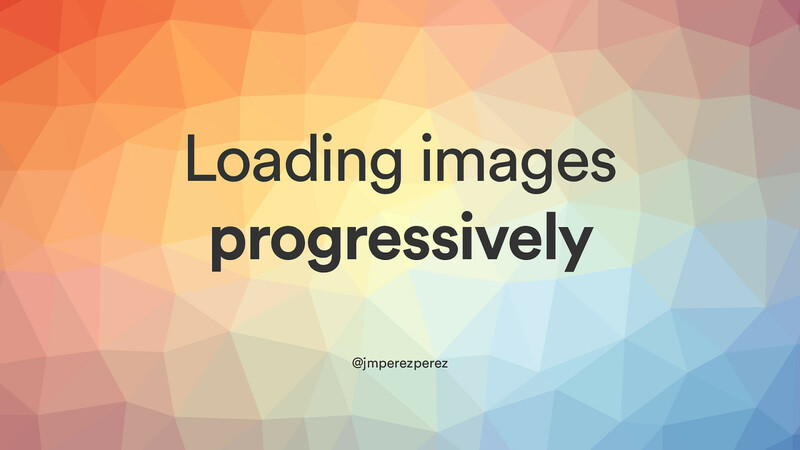 Very easy to use as another strategy in your lazy loading library. or maybe not? Harris Rodis @harrisrodis Follow I don't know about you but I don't like a bit those blurry (still loading...) images on Medium. Very distracting. 5:40 PM - 29 Dec 2015 James Young @welcomebrand Follow That blurry image preloading thing on Medium - is it just me or does it make all images load extremely slowly now? 10:53 AM - 5 Feb 2016 When, as with the Progressive JPEG method, image rendition is a two-stage process in which an initially coarse image snaps into sharp focus, cognitive fluency is inhibited and the brain has to work slightly harder to make sense of what is being displayed. — From Progressive image rendering: Good or evil? Facebook Unfortunately, the standard JPEG header is hundreds of bytes in size. In fact, the JPEG header alone is several times bigger than our entire 200-byte budget. However, excluding the JPEG header, the encoded data payload itself was approaching our 200 bytes. View Loading Images Progressively on Notist. This talk builds on top of a previous one at the Stockholm Web Performance Group meetup that explained the picture element and some image optimization tools. However, I felt that in real applications it is sometimes to put into practice, and sometimes we want to have more control on the process of requesting and loading images.